of harmony involves consciously moving out of the current path of convenience. ability to adapt and to walk the Earth with harmonic presence. in your heart reflects more power than any act of force or attached expectations. We are not here to proselytize another. We are simply here on a joy quest to master the art of devouring the beauty of life. Allow the law of attraction to unfold, as it knows how to do the work on its own. Those attracted to you either are those that will get “it,” or they are those in search of “it.” “It” meaning, what you are emanating from the heart that others resonate with. Not much is necessary to be done or said. A simple, joy and love-filled smile from you can say it all. global change is inevitable and Mother Earth will flourish with the same joy. I love the magic in seemingly arbitrary things we take for granted. partnership between “Awakened Humanity” and the “Elemental Kingdoms of Nature” together with the other “Kingdoms of Consciousness.” New relationships between Humanity and Nature are increasingly magnified in significance now more than ever. Living with respect, love, and with compassionate sharing helps us to no longer feel alone. Together we have much beauty to experience and so much more we can achieve. Becoming skilled with cocreative processes aligns and activates evolutionary vibrations to bring us closer to Source/All That Is/The Universe/Our God Essence. of that childlike hope we once had. harmonize them into intuitive, instinctual sychronicity. May the peace of the nature of the cosmos be in each and every one of us. consciousness has been moving through the energy centers of the Chakra system. By fully embracing Chakra Four, we find balance and the ability to propel into the next dimensions. Life is a continual, progressive opportunity. This Fourth (or Heart Chakra) lies center of the Chakra system and acts as integrator of the two polarities of body and spirit. It creates a bridge that merges and disintegrates all boundaries and allows us access to our true essence and the sharing of that with others. that of integration. All aspects are essential and each an important tool in their own way, enabling us to honor, as a unit, the heart, body, mind and soul, Earth, and all of creation. The Collective Consciousness is at the brink of a paradigm shift that we are all a part of, but with awareness, can now actively take part in. needed to bring us to higher frequencies of being in the New Age that is upon us. The time is now with no further excuses. The time is now for dispelling of all fear and to remember. The time is now for coming together, for realizing your authenticity, and to see beyond the veil. The time is now for unconditional compassion at the deepest heart-core level. “The greatest wisdom is in simplicity,” Mr Barrios advised before leaving Santa Fe. “Love, respect, tolerance, sharing, gratitude, forgiveness. It’s not complex or elaborate. The real knowledge is free. It’s encoded in your DNA. All you need is within you. Great teachers have said that from the beginning. Find your heart, and you will find your way.” Carlos Barrios is the author of Kam Wuj: El Libro del Destino, a book published in Spanish that explores Mayan teachings. is from this place of peaceful centeredness that love emanates as divine power. compassionately conscious business that fuses visionary services and creations. for Emerald Bridge to also inspire today’s visionaries of the world. I believe in the importance of cultivating personal expressions of creative passion and actively manifesting visions into reality. I encourage you to take courageous steps in following your heart’s joy, and to shift into new realities of experience. ideas for collaborative projects, don’t hesitate to contact me. On this magickal Sagitarrius Full Moon Lunar Eclipse, I wanted to honor the energies abound. So much is available for the embracing. Don’t forget to review your life – discard, release, and then with abundant love and creative inspiration, dream the new into being. A time for wondrous reflection and illumination. If you thought your heart was open enough, it’s time to open it even more! They say we don’t utilize the full capacity of our brains, but the same holds true for our hearts. Let us not forget this healing jewel we each have access to. At any moment we can choose greater, more compassionate, present, limitless love. And this full moon with its abundant Sagitarrian energy, supports this beautifully. This eclipse is an opportunity to examine your belief systems (Sagittarius) and keep an open mind to new ideas (Gemini – the sign we’re in this month) that will help you to create new structures (Saturn) for the change and transformation that is to come (Uranus/Pluto). Yet your heart must remain open, because the work of the soul (Chiron/Neptune) is not yet complete. So enter into the journey of this eclipse free from fear and with a spirit of adventure and curiosity and you will be on your way. I am reminded of the Mayan Moon Goddess, Ix Chel, (synchronously that I have tattooed over my heart chakra on my back due to my Mayan, moon and rabbit connection, amongst other things, and in honor of the partnership with my dear departed bunny, Nestor) as I bask in this abundant, opportunistic energy and all that she embodies. Having Moon in Sagitarrius and being born on a full moon definitely makes today feel extra special for me personally, but collectively it is such a potent time of anchoring in what you desire. Today, as I focus on a synergy of personal and collective healing and envisioning, creative painting, designing and Reiki, along with some other intentful manifesting, I feel my heart set aglow with her loveliness. Remember to dream bigger than ever before with intent for the highest good. For those of you not familiar with Ix Chel, here is a description for you. energy of all water-our most essential life giving ingredient. The Mayan stepped pyramid is Ix Chel’s mountain where she reigns as the feathered serpent energy of transformation. and irritated congestion. As a sensitive and empath, anything relating to animals would affect me greatly. clearly, as to the steps I needed to personally take in terms of everything, including my conscious food choices. This helped to align myself with the choices that were most supportive to living the life that I believed in and came into this life to express. It also simultaneously helped to raise my vibration and provide better clarity and vibrant energy. It increased my sense of connectivity, depth of compassion, unconditional love, joyful exuberance for life, as well as supported creative inspiration, and channeling my authenticity, as a direct reflection of my chosen spiritual nature. colorful, beautiful, succulent, and as vast as the variety found in Mother Earth’s natural beauty. And the array of veggie delights are no exception! to live and choose consciously. And so for me, while the trigger was a message from my physical, the core driving force for my decision was heart-felt and spiritual. I see life to be about consistency and walking the walk and so I do my best not only to be the change I want to see, but to live by what I believe and feel in my heart is right for me. you see, is what you get. There are no “behind closed doors” behaviors and thoughts in my world. what is not, and to find that right balance. And sometimes we think change is too challenging and believe a sense of loss or isolation will happen, or that it’s just too hard or timely to figure out how to do it differently. These beliefs, while valid because you believe them, are the very and only thing that holds you back from the change. As what lies on the other side of the wall you can’t see over, holds more joy, freedom and fulfillment than what you think you have now. The only hurdle is the decision to step over or stop straddling the wall, if in fact that is what you want. And there are many to help support you, moreso than ever before. And the process is so much easier now than it used to be, because so many are paving the way, which energetically creates an open path for everyone else to easily follow. then I ponder their source and explore their authenticity to my life. Is this really a me thought or feeling? Does this feel right to me? Does this match the authentic me I have come to know? Is it consistent with everything I believe in and my passionate service? Is this the desired result I want to see in the world around me? How will my authentic decisions affect not only me, but the collective? Does it matter to me that my decisions create an effect on the struggles, pains, traumas and tortures of all other beings that walk this Earth with me? In learning to follow my natural flow, I also realize that just like nature and the Earth, we all go through cycles. Some of us more than others. And it is important to listen to what your body and intuition is telling you. Doing things just because you are good at discipline doesn’t always produce the most benefit to your life. Doing things because it is your heart’s passion and consistent with your core beliefs and authentic self, will reap abundant fulfillment without feeling a sense of loss. And along with this, there are times our bodies and paths energetically need certain things more than others. Not because some doctor, the FDA, commercial, or article you read said so, but because your body, heart and soul needs so. this balance to be very healthy, to feel good, and keeps me grounded and at optimal functioning, as well as maintains a level of tolerance in my body that enables me to travel and be in different social situations when needed. make healthy, conscious, preferably organic choices. I personally believe, and have experienced, that vegan foods really support more conscious, clear, healthy, harmonious and loving vibrations for individuals and the collective planet. Any small shifts towards some vegan foods, in your own way and timing, can be extremely transformative and effective in your life and for the Earth. And supplementing at least some raw vegan veggies/foods or green juices can increase all of that to an even more optimal level and when needed, can produce miraculous results in reversing illnesses, shifting behaviors and emotional challenges, as well as create clearer channels of creative inspiration and vibrancy. No matter how I swing, I ALWAYS maintain a 100% strict vegan diet across the board, which means I never consume any animal products, and I make every conscious effort not to purchase any commodity that comes from, or has been tested on, animals. For the sake of being open, I also have personally opted to leave all alcohol out of my life (not touching any for the last 6 years )and have never once in my life touched a cigarette or any form of drug or mind-altering substance. These are all personal choices and my chosen path because they authentically mirror “my” beliefs and what is authentic to me and my heart and what makes me feel I’m operating at my optimal. Everyone has their own path and it is not for any of us to judge what that path is. For myself, I have just never had any resonance towards certain things since I was a little girl and part of that stems from my desire to utilize my own capacity and abilities to go to desired states of experience. Interestingly, I have been told that some of the art I create is similar to what some have seen in their altered states. Hence, I have no reason personally to go there. My inner world, imagination, dreams, and “travel” are crazy enough as it is! when I’m out or feasting with friends! I follow what my body tells me, consciously, and I find that the less I try to create rules, the more my body falls into its natural rhythm and doesn’t have to do the extremes as often. And, if it does, I allow it and by doing so it quickly gets back into finding a new, healthy balance, which is ever-changing as I am, because I honored it. another option, as well as local meetups and potlucks. I used to live in Reno, where I did not have all the plethora of options as I do here in Southern California, but I STILL managed to get what I needed, whether thru personal chef services, ordering out-of-state weekly meal boxes from such places as “Seed” in Northern California or Rawvolution in LA, getting quick and easy recipe books to do myself and asking local chefs to help out. If I can do it, anyone can. Maybe if you have a friend or friends interested as well in switching diets, you can each take turns making meals. Make them in servings that can be enough for each of you to share and it will cut down on the amount of time to prepare yourself. horizons and possibilities and above all to live life with conscious choice. Sometimes we neglect to ask ourselves the questions like, “Why do I do this?” and don’t follow through with the answers. Perhaps because we don’t want to really know the answers for fear of what that might mean to our lives as we’ve known them, or that we might find ourselves alone, which never really is accurate, as the moment you make a decision and act upon it, suddenly you draw in resonating others that mirror the new choice. also celebrate the beauty of every human who shares it with them. Nutrition can be a spiritual experience and enhances your spiritual nature. Conscious choices are empowering choices. This is a time of remembering. The time to experience the mystery of life in its reality. A time to allow and embrace all that is in your heart to come forth, putting aside fears and drawing forth your soul’s authentic voice to commune with those of others in symphony. The butterfly is a beautiful and powerful example for us to learn from. So much of the answers we seek are present in the miracles that are all around us as gifts from Mother Earth. We need only to look with our hearts and be consciously present to receive. In a previous post, I shared a little bit about the Mayan Hunab Ku symbol, also known as the One Giver of Movement and Measure and the Galactic Butterfly (my favorite description). I wanted to explain its symbolism a little further and its connection to the now, as well as its butterfly connection. 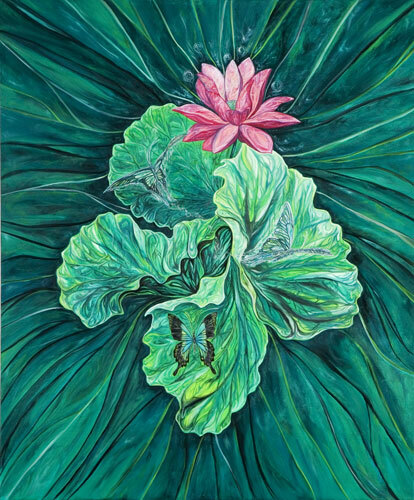 To the Mayans, butterflies are seen as ancestors returning for a visit to physicality, and part of that return is to support the shifts in consciousness by bringing back the wisdom, integrated into the now, for a return to natural harmony. This symbol is very powerful, as it broadcasts one’s reaching to actively join the consciousness of our galaxy. 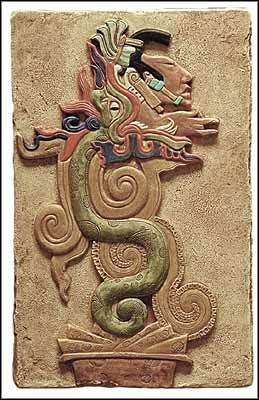 The Maya taught that the Milky Way Galaxy is the generator of life. The architect of the universe is called Hunab Ku, The Absolute Being, The Center of the Galaxy, The Universal Dynamism, which stimulates and motivates life in its total manifestation of spirit and matter. The principle of intelligent energy that pervades the entire universe. Hunab Ku is understood to transmit radiant energy information through stars which serve as lenses to transmit energies to planets. Our Sun is the chief mediator of Hunab Ku for our planetary system, the lens by which Earth receives direct galactic information. The pulsations of Hunab Ku are understood as a language of codes and energies recorded in the form of the Tzolkin, a universal harmonic module accommodating every possible permutation of Hunab Ku, also known as the Sacred Calendar. Numerically, Hunab Ku is communicated as the union of numbers 13 and 20, which represent movement and measure, energy and form, spirit and soul. Hunab Ku, who can see and understand everything, knows that the time for the great change has come. We will complete a 26,000 year cycle, according to the calender on 12/21/12 – not the end of the world, but the beginning of a new experience of life as we have never known. A new cycle has already begun and life as we know it is evolving continuously and rapidly. A cycle that calls us to realign with the cosmos, which can provide essential energy needed to live together harmoniously and with honor for our Mother Earth. We are not separate from anything or anyone. These are the times in which all races, from all directions, must come together in harmony and unity. The Hearts of All Beings are connected. It is impossible to be disconnected. Many indigenous peoples of the New World hold butterflies in a special place in their culture and butterfly motifs were used everywhere including ceramics, stone carvings, mural paintings, codices, feather work, wood carvings, and gold ornaments. They appear not only in pure form, but in many highly stylized renditions, sometimes so abstract that they were frequently misinterpreted by pioneer archaeologists. 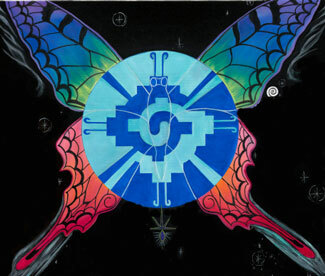 Xochiquetzal, symbolized by a Mayan mythological butterfly, was called “precious flower” and regarded as a mother goddess, goddess of love, goddess of flowers, as patron of all fine arts, as the symbol of beauty, as the symbol of fire, as a symbol of the spirits of the dead, as the patron of domestic laborers and as the patron of warriors killed in battle. Itzpapalotl, the Aztec “obsidian butterfly,” was a mother goddess, goddess of obsidian and knives, of human sacrifice and of war, the personification of the Earth, the patron of women who died in childbirth and more. Massive figures of warrior-priests (about 15 feet high) have breastplates decorated with a butterfly motif. Along with the snake, the butterfly was one of the most frequently represented animals of Ancient Mexico that held deeply religious symbolism. Butterflies represented fire, soul, death, warriors, travelers, and hummingbirds. They were a component of many poems and songs. 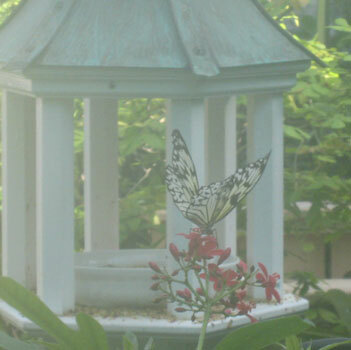 I celebrate the beauty of the butterfly, recognizing it’s rich spirituality and honoring it as I would myself. For, if butterflies are said to carry the souls of our ancestors, then isn’t it quite possible that all creatures, great and small, possess the essence of intelligence beyond what we are presently conscious of? We have much to remember. Nature has so much beauty to behold and the butterfly is an exquisite example of the precious miracle of life. I am extremely connected to the animal world and power animal guides and totems are prevalent in my spiritual and daily experience. That connection runs very deep, more than I can explain in words, and I feel that they channel through me so that I may share their messages to help integrate into the healing work I do. So it is no wonder that I carry many of them on my “Spiritual Skin” body canvas art of sacred tattoos and that they consistently show up in my paintings and in all aspects of my work. I see no separation between anything and that every thing has its own consciousness equal to our own and is interconnected. It is simply the channel of manifested expression each part of that consciousness chooses to express itself as, that conveys in visual difference, but the heart of their personal petal is from the same flower essence whole. When we understand this, a whole new and beautiful experience of life opens up – and the way we walk through life completely changes. According to shamanic belief, everything is alive and carries with it a wisdom and power. Shamanism is found in all cultures of the Earth and is the world’s oldest healing tradition. This ancient, worldwide practice involves engaging with spirit helpers and the forces of the natural world to develop relationships, solve problems and perform healing. Shamans travel to the parallel worlds where time and space have no meaning and use the powers of those worlds, the subconscious and the realities of this world to cause change. They are able to go within and enter an altered state of consciousness at will, in order to contact and utilize a hidden reality that most do not consciously perceive. Power animals are essential to shamanic practice, as shamans believe that everyone has power animals. These power animals act as guides or angels, imbuing their individual energy, power and wisdom to guide, heal and protect you. They provide the wisdom of their kind and are not only limited to mammals, but can also be reptiles, insects and sea creatures. Any living creature can serve as a power animal and plants and trees can serve as plant spirit guides, providing their own wisdom. I created a painting, the one you see to your right (which you can see larger on my website: www.taniamarie.com) to honor the energy of what I’m sharing here and to provide a healing portal that can be utilized for embracing these energies. 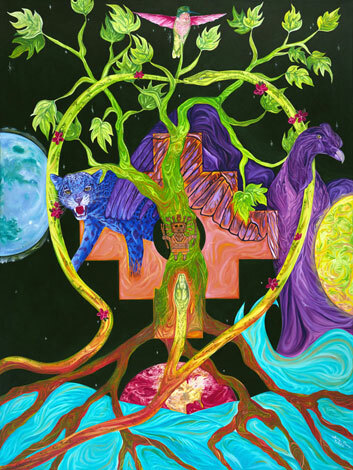 I combined the Incan Medicine Wheel, with Tarot, seeing its connection with the World Tarot Card symbolism and created a visionary interpretation of the two synergized. I love this link, below, that shares about the Incan Medicine Wheel and each of its components and how we can utilize the symbolism to create integrated wholeness: http://www.healinghappens.com/medicinewheel.htm I hope you enjoy! All of the work I share is heart-focused on supporting us into a more compassionate, responsibly conscious, integrated and abundantly expansive, loving, joyous, creative experience. There are many ways, modalities, tools, thoughts, beliefs, and steps people can choose to follow and practice and I in no way discount any of their validity if they feel true to, and work for you. We all find our own way through what resonates for us and all are of value. Everything is a “tool” that can support us in reconnecting, remembering and reactivating our wholeness. When seen in this way and without attachment or used as a crutch to avoid your own divinity, but rather as reminders and awakeners, then you don’t get lost outside of yourself. I have found that in all of my years of reading, searching, studying, practicing, listening, observing… that what we think is complex can actually be very simple and that we tend to strive for something that is already within us, feeling that there must be more or that we must attain all the knowledge there possibly is before we can actually achieve or create what we desire. I find this, for myself, to be inaccurate and that the answers lie in the core of our hearts. I have always been drawn back to ancient civilizations because of my resonance with their simplicity and potent symbolism and have learned to integrate the timeless wisdom of then into the now. I have many ancient symbols, images and writings tattooed on my body for this very reason – part of creating my skin as my own personal portal of sacred art, helping to heal, integrate, activate, and access – bridging physical and spiritual. In simple terms, to return to the innocence of my wholeness, embody what I’ve come to believe, and to be a beacon simply by that being – be the change. I’ve written a book on this, which you can find at www.spiritualskin.com. 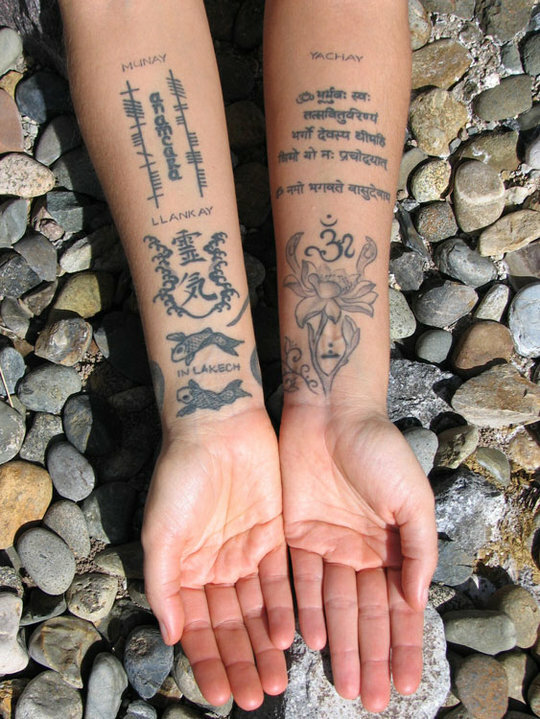 In the book I describe how I’ve utilized tattoos in this way and how my hands and arms are the one place I have ancient writings and symbols, while the rest of my body is adorned with images, which include the four sacred directions of the Inca medicine wheel as symbolized by animal totems that are guardians of those worlds. Included in the writings I wear are the Three Incan Laws or Principles, which are simply encompassed in these three words that hold vast meaning. I’d like to share them, as they speak to the heart of things in simplicity – how we can personally and collectively create the New Earth. The energy of universal and unconditional love that resides in the heart chakra, bridging our lower and higher selves and is a consciousness of acceptance and appreciation for all creation and All That Is. The tattoos on my inner arms, where you will find the 3 Incan Laws inscribed along with several other ancient scriptures, mantras and symbols. is in service to their fellow Man as well as the cosmos/the Divine. Shows us it is wise to live consequently and with integrity and without fear. It allows us to express our creativity through our work and can also be thought to symbolize the power of the physical body, or our animal selves. When Munay and Llankay are in proper balance and relationship, it allows one to manifest the third Inca law of Yachay or the energy of “wisdom” and is more of an inner knowing and higher consciousness of our “authentic”, or true, selves residing in our three, upper chakras, centering at our 3rd eye. Yachay allows us to have inner peace and joy, through stillness and presence, as we release our identity with the several roles we play in life which have the tendency to bind us down and prevent us from “remembering” who we truly are. Yachay is all about living in the present. Living by these three principles help to create a world of peace, balance, joy, beauty, grace, and harmony.